To the Israeli government, the periodic slaughter of Palestinians in Gaza is called “mowing the grass,” a chore that frequently needs repeating. But this violence is wearing on the world’s conscience, including moral objections from more and more Jews. As the Israelis once more inflict collective punishment in Gaza (a tactic which happens to constitute a war crime), it is time to consider the mind-set behind their repeated violent and sadistic behavior. One way to do so is to listen to the rationalizations they use, also repeatedly, to justify their actions. Among the many rationalizations offered by Israeli leaders for their violent behavior is the assertion that the Arabs, and Palestinians in particular, “only understand force.” If you do not use force against them they interpret its absence as a sign of weakness and this only encourages them to stand against the Zionist state. This notion that the Arabs only understand force is one of the holdover stereotypes of a mostly, but obviously not completely, bygone age of imperialism.When it comes to the Israelis, this persistent myth about the need to employ force against the Arabs is mixed up with their own post-Holocaust determination to “never again” react to a threat passively. They believe that sort of reaction is what killed millions of European Jews, and so it is no longer psychologically acceptable. The core problem with these lines of thought is that they are seriously misleading – both in terms of Arab/Palestinian perceptions and European Jewish behavior. Since coming into existence in 1948, Israel has attacked Palestinian individuals and infrastructure thousands of times. Israeli conventional wisdom would claim that this has been done in self-defense and to dissuade the Palestinians from future attacks. The self-defense rationale is misleading because Israelis have, from the beginning, been acting offensively: most of what is now Israel and the Occupied Territories was taken violently and then ethnically cleansed of most of its Arab inhabitants with the ongoing goal of setting up a religiously exclusive state. Palestinian violence has always been a reaction to Israeli aggression. The argument that harsh retaliation against Palestinian acts of resistance would dissuade them from further resistance (that is, the Palestinians “only understand force”) proved long ago to be false. It has never worked, and yet too many Israelis have clung tenaciously to this lie (a small minority, such as the Israeli journalist Gordon Levy, know the lie for what it is and bravely keep proclaiming the truth). Why has the lie persisted so long? Well, there is the old adage that doing the same thing over and over again and expecting different results is a form of insanity, but perhaps that is a bit too superficial for the case at hand. One reason for Israel’s repetitive violence is that if Israelis admit it is a tactical failure and desist, they might have to negotiate a genuine peace treaty with the Palestinians. Many will immediately say that they have, repeatedly, tried to negotiate while always coming up against Palestinian intransigence. However, if one takes a close and objective look at these efforts at negotiation, one finds that they are facades or false fronts behind which we find Israeli intransigence. As the liberal Zionist M. J. Rosenberg has pointed out, the Israelis have never negotiated in good faith. When the Palestinians react to Israel’s bad faith, the Israelis break off negotiations and blame the Palestinians. Israel then returns to its pattern of repetitive violence. In truth, negotiating in good faith means compromising Israel’s ambition to settle all of the land of Palestine, and that is something the hard-core Zionists will not do. As a consequence it is not the Israelis, but the Palestinians who have lacked a partner who will negotiate responsibly. Another reason for the repetitive violence is that once Israel has raised several generations of citizens to believe that the Palestinians are implacable enemies who “only understand force,” it becomes politically difficult to change the message despite its elemental falseness. 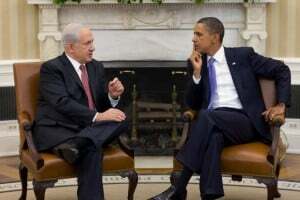 The myth of the impossibility of negotiating with the Palestinians is believed by so many Israelis that if a politician started advocating a genuine compromise, he or she would be marginalized or worse. Remember the fate of Prime Minister Yitzhak Rabin, who almost certainly was not operating in wholehearted good faith toward the Palestinians but was assassinated anyway because of the fear that he was moving in that direction. Finally, there is the connection the Israelis make between giving up their violence and appearing weak. Yet given their overwhelming superiority in weaponry and the fact that its repeated use has destroyed Palestinian society without stopping Palestinian attacks, why be concerned that switching to non-violent tactics, such as good faith negotiating, would signal weakness? My guess is that the Israelis aren’t really afraid that the Palestinians would interpret things this way. The Israelis are concerned that they themselves would feel that they would be replicating the alleged passivity of European Jews in the face of the Nazi onslaught. In other words, the Israeli fear of showing weakness is not an attitude that references outside groups. It references only the Israeli concern for their own self-image. It is the fear of seeing themselves as akin to European Jews passively going to the gas chambers that stands as the greatest psychological barrier to an Israeli decision to halt their repetitive violence. As noted above, this is so despite the fact that their interpretation of European Jewish behavior is historically misleading. For hundreds of years Europe’s Jews faced discrimination and persecution that periodically turned violent. These episodes of violence, known as pogroms, were murderous but short-lived. The Jewish communities learned that if they kept their heads down and allowed the storm to wash over them, their casualties were less. They learned this not just by being passive, but by comparing such behavior with the consequences of active resistance. When in the Twentieth Century the Nazis’ anti-Semitism emerged, most of the Jewish leadership interpreted it as yet another episode of pogroms, and they reacted to it in the manner that history had taught them would result in the least harm. Of course, they were wrong. The Nazis were a qualitatively different sort of enemy. But the Jews of Europe only discovered this when it was too late. Still, there were plenty of episodes of active Jewish resistance ranging from concentration camp revolts to the battle of the Warsaw ghetto. Unfortunately, the Israelis and most other Zionists forget about this history and condemn Europe’s Jews for being shamefully passive in the face of mortal danger. Thus was born the slogan “never again.” This state of mind also encouraged the Zionists to see the Palestinians, and indeed all Arabs, as latter-day Nazis to be repeatedly vanquished with repetitive violence. The Israelis would expel or kill a majority of the Palestinians left in their homeland if the world let them. Israel would do so not only because it would clear the way for Jewish settlement of all of Palestine, but also because it would allow the Israelis to feel psychologically redeemed – redeemed from the allegedly sinful passivity displayed by the victims of the Holocaust. The consequences of this state of mind are, of course, catastrophic – first and foremost for the Palestinians, who suffer death and destruction for their justified resistance to oppression. The Zionists see them as latter-day Nazis but in truth they resemble the resisters in the Warsaw ghetto. And, if that rings true, then who do the Israelis now resemble? That point leads us to ask what are the consequences of Israeli behavior for the Jews and Judaism? After all, Israel claims to represent world Jewry. So, the consequences of persecuting the Palestinians have been, are and will continue to be disastrous to the reputation of Jews and Judaism. In relation to the Israeli-Palestinian conflict, there are now three categories of Jews: a) those who have publicly taken a stand opposing Israel’s behavior; b) those who publicly support Israel’s behavior and its rationalizations; and c) those who stand aside, try to ignore what is going on, and just carry on with their lives. Whatever the people or situation, this last category is usually the largest. It is also the category that concerns me the most for, unbeknownst to many of these Jews, their wellbeing is being used falsely to justify the policies of a habitually violent state and its racist ambitions. But there are intimations that this largest group of Jews is becoming conscious of Israel’s crimes and this is a welcome and necessary beginning. The next question is what actions, if any, will consciousness bring?